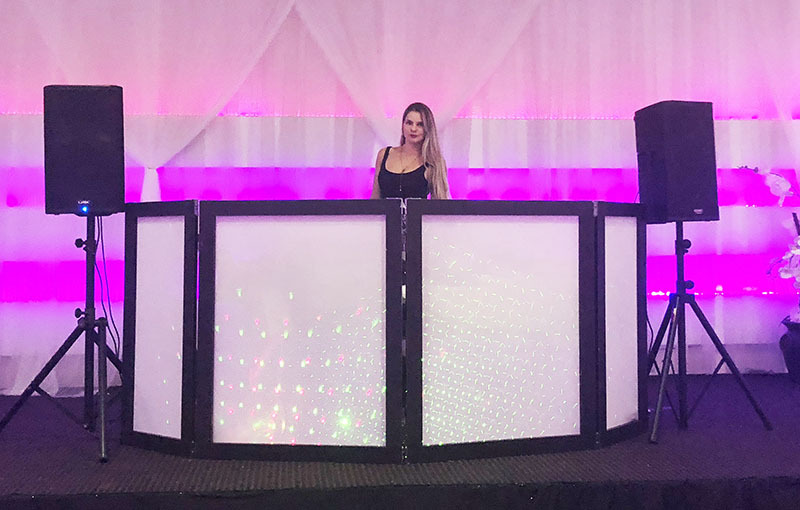 Russian-American DJ Alisa provided music for wedding that took place at the Temple Sinai of Hollywood Eden Regal Ballroom & Catering, 1400 N 46th Ave, Hollywood, FL 33021 on Sunday, September 2nd, 2018. Alisa mixed popular bachatas, merengues, European, German, Russian, and American dance hits, popular music, and a few requested songs, music for the ceremony, music for coctail hour. MC Mikhail provided bilingual entertainment: Grand Entrqance, Bread and Salt Ceremony in the end of cocktails, announced toasts from parents, Maid Of Honor, Best Man, STEAL THE SHOE GAME, first dance, father-daughter dance, remove the veil, toss the wedding, remove the garter, and others DJ Alisa started providing DJ services in Florida, New York and New Jersey since 2011. 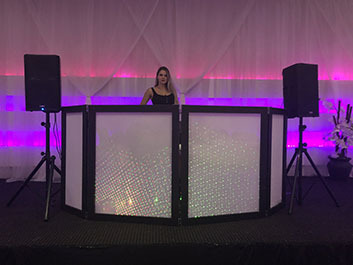 She was mixing music for New Year's Celebrations, Halloween parties, private parties, Ukrainian events, kid's parties, Bar and Bat-Mitzvahs, weddings in New York City, Brooklyn, Queens, Long Island, Pennsylvania, New Jersey, Connecticut, Florida, and other states. 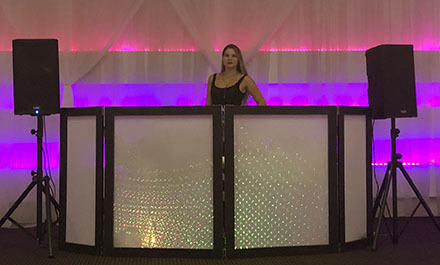 DJ Alisa is one of the few female DJs who speaks both Russian and English. 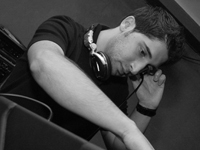 DJ Alisa (Russian: Алиса) was born in St. Petersburg, Russia. MC Mikhail, DJ Elina, and DJ Alisa provided bilingual Russian MC tamada entertainment and DJ services in Australia, Canada, Barcelo Bovara Palace Deluxe, Punta Cana, Dominican Republic, La Amada Hotel, Resort and Marina, Playa Mujeres, Mexico, Now Sapphire Riviera Cancun, Puerto Morelos, Mexico, Iberostar Paraiso del Mar, Playa Paraiso, Mexico, Fairmont Mayakoba Riviera Maya Hotel, Riviera Maya, Luxurious Beachfront Villa in Casa Herdz, Aguadilla, Puerto Rico, Wrigley Mansion in Phoenix, Arizona, Los Angeles, CA, Royal Palace Banquet Hall, Glendale, CA, St. Francis Yacht Club, San Francisco, CA, Magdalena Banquet Hall, San Francisco, CA, Shutters on the Beach, Santa Monica, CA, The Branford House Mansion, UConn Avery Point, Groton, Connecticut, Private house in Trumbull, Connecticut, Pond House Cafe, West Hartford, CT, Park Hyatt Washington, Washington, D.C, Top Of Daytona restaurant, Daytona Beach, Florida, Bonnet House Museum and Gardens, Fort Lauderdale, Florida, Temple Sinai of Hollywood Eden Regal Ballroom & Catering, Hollywood, FL Tapestry Park Community House, Panama City Beach, Florida, Santa Rosa Beach, FL, West Palm Beach Mariott Hotel, West Palm Beach, Florida, Bonaventure Resort Spa, Weston, Florida, Birthday party on the yacht, Waikiki, Honolulu, Hawaii, Kaanapali Beach Hotel, Maui, Hawaii, Astoria Restaurant and Catering Hall, Buffalo Grove, Illinois, Astoria Restaurant, Chicago, IL, Russian Tea Time, Chicago, Illinois, The Tirnanog, Lake Villa, Illinois, Indianapolis Marriott North, Indianapolis, Indiana, Wellesley Community Center, Wellesley, Massachusetts, PJ RICE BISTRO, Wheaton, Maryland, Birthday party in Lake Ozark, Missouri, Monarch Private Event Spaces, St. Louis, Missouri, McGuire Millrace Farm, Murphy, North Carolina, Wilmington Shell Island Resort, Wrightsville Beach, North Carolina, Searles Castle at Windham, Windham, New Hampshire, The Landmark, East Rutherford, New Jersey, Fort Lee, NJ, Restaurant "Zabava", Independence Township, NJ, "The Alan Catering & Events", Lodi, NJ, Mansion on Main Street, Voorhees, NJ, Tides Estate, North Haledon, NJ, Stony Hill Inn, Hackensack, NJ, Manalapan, NJ, Chart House Restaurant, Weehawken, NJ, Dutch Apple boat river cruuise, Albany, NY, Crescent Beach Club, Bayville, NY, Baku, Brooklyn, NY, Paradise Garden, Brooklyn, NY, Russian-Tatar wedding, Prospect Hall, Brooklyn, NY, Romanoff, Brooklyn, NY, Russian-Jamaican wedding, Tatiana, Brooklyn, NY, Russian-Mexican wedding, Tatiana, Brooklyn, NY, Corporate event in New York City, Polonaise Terrace, Greenpoint, NY, Water Club NYC , New York City, Pink Lady boat, Sheepshead Bay, NY, Snug Harbor Botanical Garden, Staten Island, NY, Russian restaurant "Crystal" in Jamaica, Queens, NY, Crest Hollow Country Club, Woodbury, NY, Royal Regency Hotel, Yonkers, NY, Country Club of Scranton, Clarks Summit, Pennsylvania, Hyatt Regency Philadelphia Penn's Landing, Philadelphia, PA, Banquete Hall, Pittsburgh, PA, Kavsar Halal Restaurant, Pittsburgh, PA, Northampton Valley Country Club, Richboro, PA, Schenley Park Visitors Center and Cafe, Pittsburgh, PA, OceanCliff Hotel, Newport, Rhode Island, Lynchburg, TN, Key Bridge Marriott, Arlington, Virginia, Fort Belvoir Officer's Club, Fort Belvoir, VA, Westridge Club House, Woodbridge, VA.